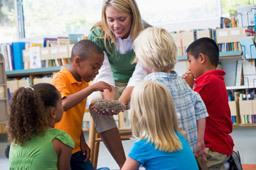 Our Kindergarten program continues the same Montessori philosophy of education we teach throughout our entire school- educating the whole child. In addition to our Montessori program, we provide a developmentally appropriate curriculum which prepares each child emotionally, socially, and cognitively for the first grade. Our children are exposed to various educational theories and methodologies, therefore making the transition to first grade successful. Not only are our children prepared for the first grade, they will most likely excel at their first grade experience. Our goal is to instill in each child a lifelong love for learning.